As you can imagine, I did not have a problem with this plan. As I am known to do, I hit up google and yelp, delving the recesses of the web for information regarding the restaurant. I did not have to dig for very long. 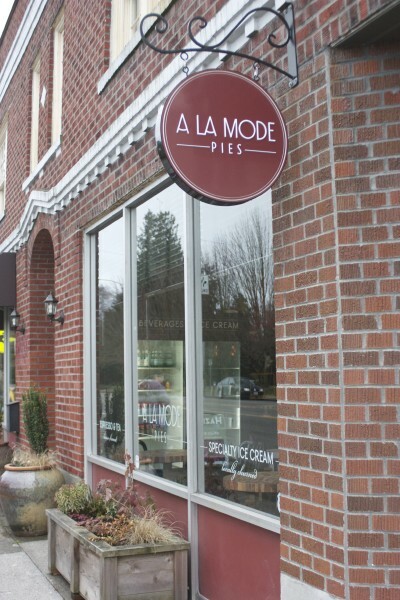 Our destination was A la Mode – an artisan pie cafe on the corner of 59th and Phinney, just across from the Woodland Park Zoo. A quick perusal of Yelp shows and average of 4.5 stars over 145 reviews of the restaurant, which any casual reviewer will agree is a feat in itself. When perusing Yelp, I tend not to read the actual reviews unless there’s something very specific that I’m searching for, so I moved on to more official sources. 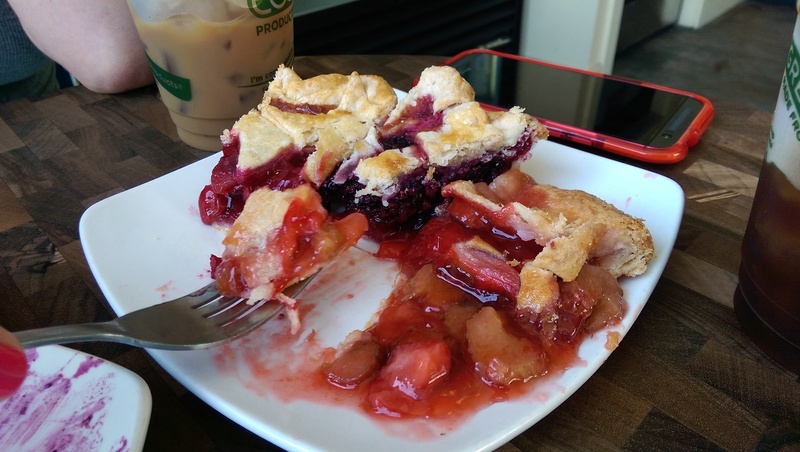 Posts that I found from Seattle Magazine, All You Can Eat, and City Arts Magazine were encouraging, and piqued my interest in both the owner of the business and his “flagship” pie – the Blue Hawaiian. Neither would disappoint. The first thing that strikes you about the owner – Chris – is that he loves his job. When we walked into his cute little shop, I was struck by two things: the amazing, rich scent of fresh-baked pastry – which bore me instantly back to younger days of waiting hungrily by the stove as mom removed freshly-baked apple pies from the oven – emanating from the ovens in the rear of the store, and the gentleman at the front who just seemed genuinely happy to simply have us come in, much less share his delectable creations with us. The cafe itself is a cozy little space with a short bar and a few tables. 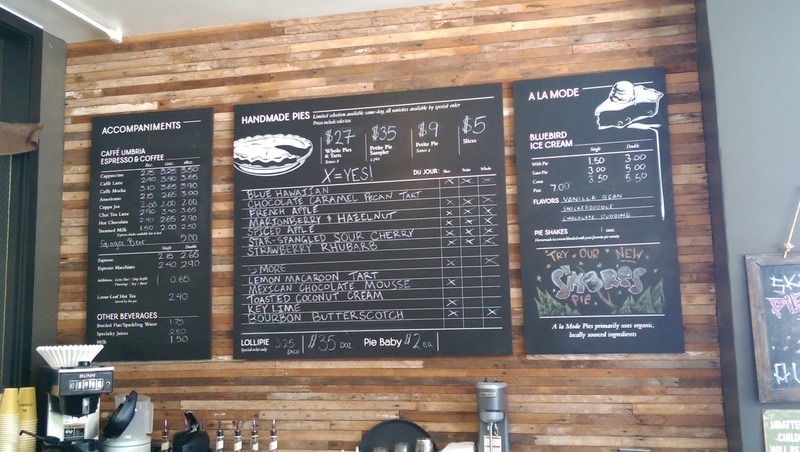 The employees were friendly and eager to please, and after ordering a couple of drinks – an iced americano for myself and an iced latte for my wife – we pulled up a seat and prepared to tuck into some pie. The serving process reminded me vaguely of a clown car: each time I thought “this HAS to be the last plate,” another one emerged. The first pies to emerge were the three above. The apple selections were delicious, but the standout was the Blue Hawaiian. This slice – which Chris described as an attempt to make something “a little different” with less added sugar than a normal pie – is a combination of flavors not easily ignored. It has the taste and feel of a traditional blueberry pie with a little something extra, like merging the nostalgia of childhood with the excitement of a Hawaiian vacation. 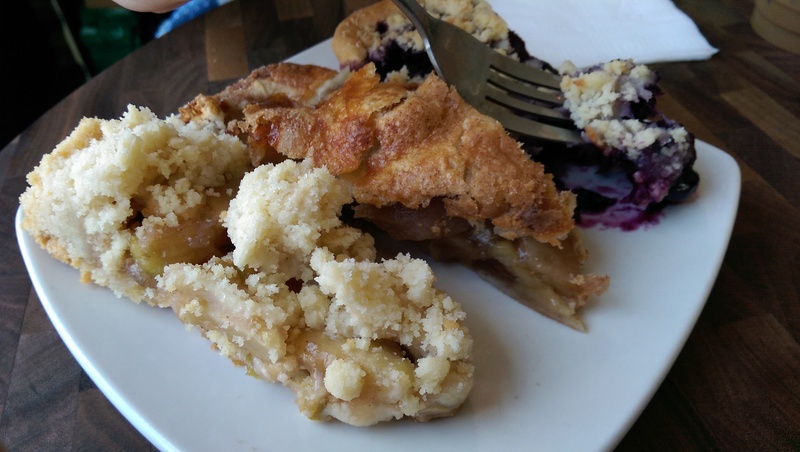 The pie is loaded with rich, blueberry flavor, which is happily punctuated with notes of pineapple and coconut. 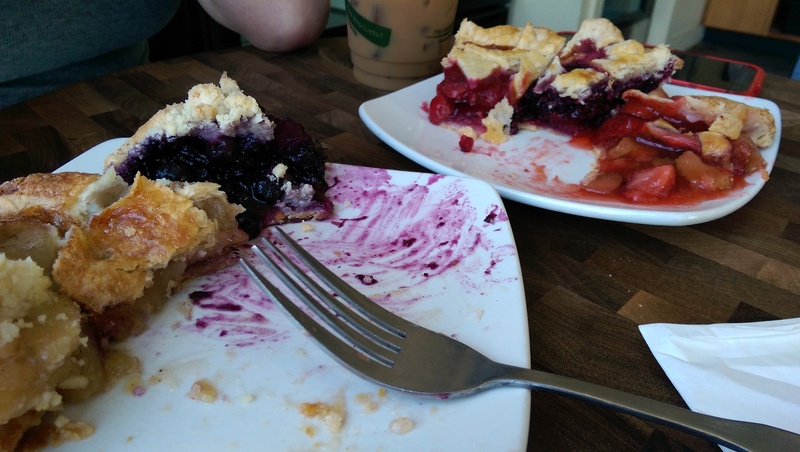 This first round of pies also made it clear that the shop tailors the crust and toppings specifically to each type of filling. The next plate was equally as delicious, and solidified my initial thoughts about the crusts. The pies were warm and flavorful, the crusts walked that wonderful line of flaky yet moist and buttery, and each filling stood out in it’s own unique way. The next plate contained samples of the Bourbon Butterscotch, Key Lime and Mexican Chocolate Mousse. Each piece -again – had it’s own unique character, but the standout for me was the bourbon butterscotch. 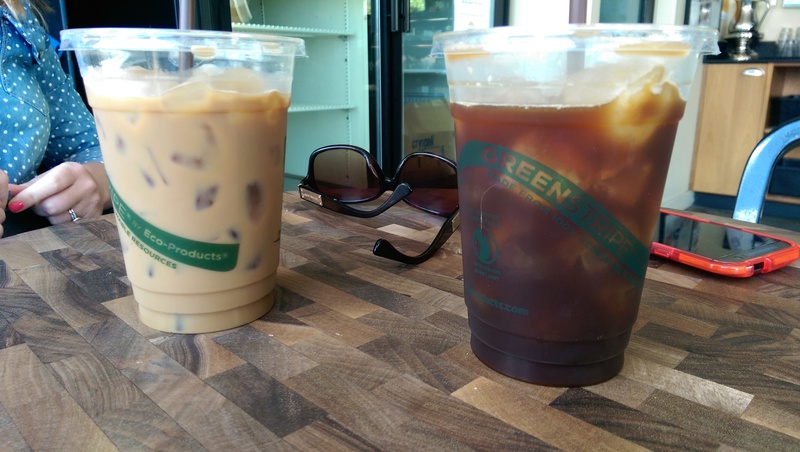 The rich, creamy pudding with hints of bourbon in the mix was perfect with the crumbly crust and the iced Americano from which I was sipping. 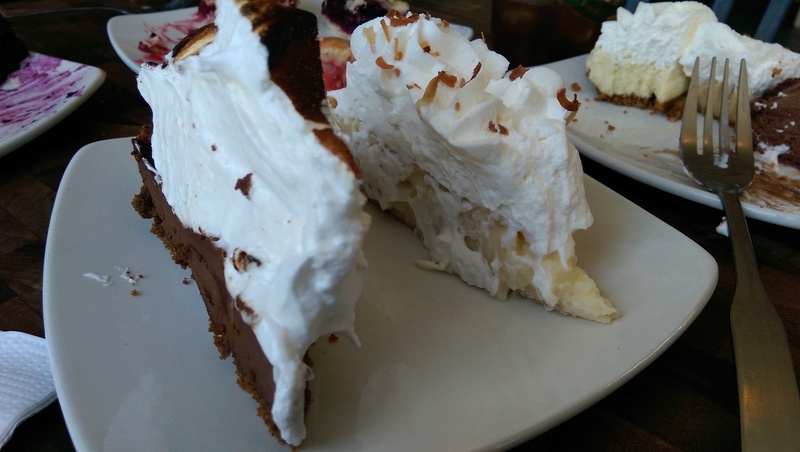 The final round, which we were shamefully too stuffed to finish, was a slice each of coconut creme and one of their new creations, a S’Mores-inspired pie made with smoked chocolate. It could have just bee that it was the last thing I tried to eat, but the S’Mores pie was a little rich, and a little too smoky, for my taste at the time. 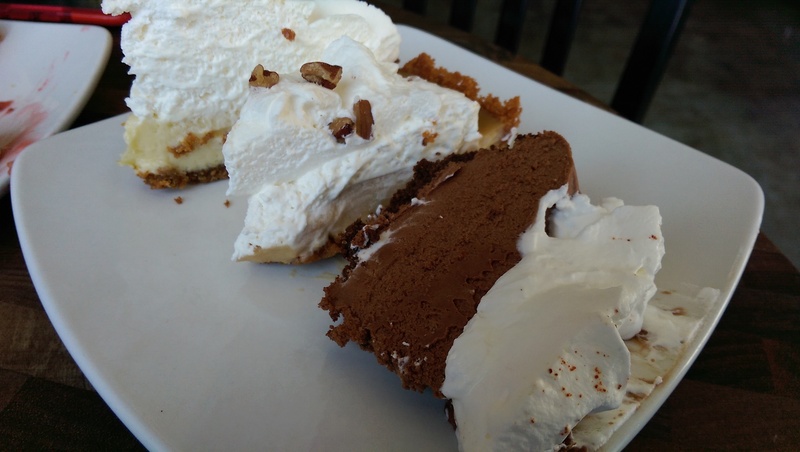 Of course, they were nice enough to wrap up our leftovers and send us home with a box of treats to enjoy later, which is why I can say – definitively – that the S’Mores pie makes a wonderfully rich breakfast wen consumed alongside a cup of coffee and an episode of Dexter. Note: Dexter isn’t necessary for the pie to be good for breakfast. 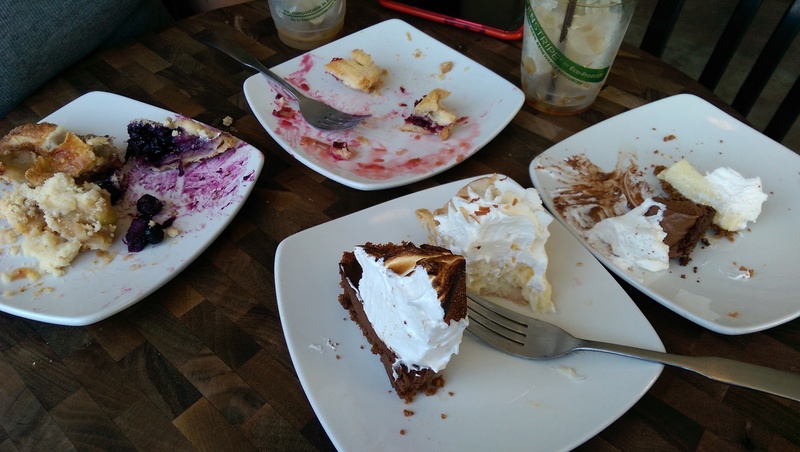 The final verdict: while all of the pies we tried were delicious in their own right, the standouts (for me) were the Blue Hawaiian, the Marionberry Hazelnut and the Bourbon Butterscotch, while my wife was drawn also to the Mexican Chocolate Mousse. The final final verdict: we both agreed that we will be returning to A la Mode!